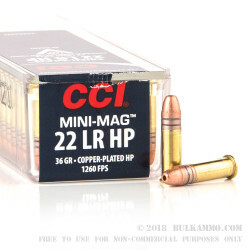 CCI's Mini-Mag line of 22 Long Rifle ammo is highly sought after by seasoned 22 shooters. 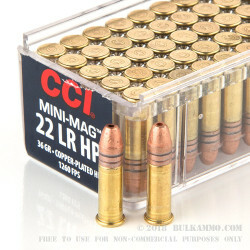 Mini-Mag ammo is well known for being able to reliably cycle a wide variety of semi-auto's and is reasonably clean and has a low failure rate compared to cheaper 22 ammo. 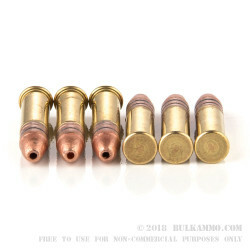 This ammo is topped with a 36 grain copper plated hollow point bullet that works well for hunting small game with controlled expansion of the bullet resulting in a larger wound cavity and effectively transferring energy into your target. This 22 LR ammo has a muzzle velocity of 1260 feet per second and is very accurate. Loaded at CCI's Lewiston, Idaho plant, this ammo has earned a top-notch reputation in its iconic plastic tray presentation. Good stuff! cycles every semi-auto I have, and hit what I am looking at. I was looking for a reasonably priced copper jacketed 22 lr. This is near perfect for my purposes. The bore was easy to clean on my M&P 22 Compact. No copper residue. In general the CCI was easier to clean after shooting with little powder residue compared to my Federal bulk ammo. I hope it is made available again at the price I ordered it in the past. I really wish CCI would provide this bullet without the easily broken plastic containers. A hundred loose rounds in a box (500?) would be fine with me and I'll bet less expensive too. After all I just pour a couple of hundred rounds into an ammo container to take to the range anyway. A little expensive, but shoot good. Ordered 2000 rounds on Thursday night, received it Saturday morning. Been waiting for CCI to reappear, it is the only ammo that is reliable in my ar-7. Love that Bulk ammo does not play the two box per customer game. Cost is up, but I guess that is the new reality. Bulk ammo is my only choice for my ammo needs. Keep up the excellent service and thanks. 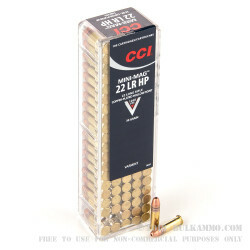 Good ammo, but its hard to find great 22lr. Q: What is the FPS on this ammunition? A: Hello James! CCI lists the muzzle velocity of this 36 grain round to be 1260 fps. Q: What is the shelf life of these? Will sealing with dessicants prolong it? A: Properly stored, modern ammunition is safe and reliable to shoot after decades have passed. Desiccants are a good way to help ammunition last as long as possible, and sealing the ammunition away from the elements will also be a great help.